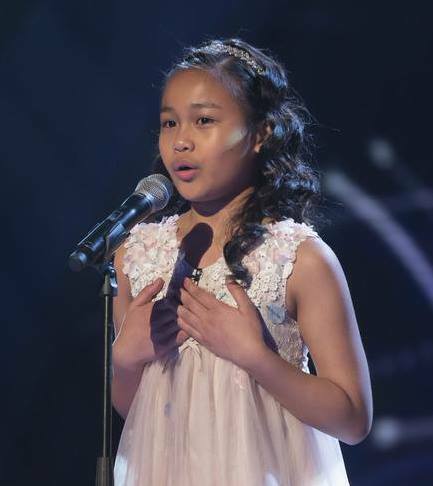 Arisxandra Libantino is an English prodigy singer from Filipino descent, she was born in 2001, so at the time of writing this post, Arisxandra is 13 to 14 years old. Arisxandra rose to the spotlight in her audition to Briton’s Got Talent in February 2013 (which aired on 13 April), she performed ‘One Night Only’ and received a standing ovation from the judges and she stunned the crowd with her voice and talent. In the semi-final of Briton’s Got talent, on 27 May, Arisxandra performed ‘I Have Nothing’ and was sent through to the final with the support of the public votes. Arisxandra Libantino performed ‘The Voice Within’ in the final on 8 June. She finished in eighth place with 2.9% of the vote. Arisxandra’s story is a small piece of the bigger picture. Arisxandra’s parents moved from Philippines to the United Kingdom with hopes of a better future for their children. Arisxandra’s dad works as a cleaner and her mom works as a caregiver. A successful singing career for Arisxandra would certainly make life much easier for them. The other side of the story is that of Arisxandra’s fans. The whole world loves her, Filipinos are proud of her and happy to see their “Kabayan” shine brightly. Everyone is asking? Why isn’t Arisxandra more popular than she is now? Why hasn’t she been invited to American Idol? Her most recent professional appearance was on the Romanian TV Show “Next Star”. Here is her final performance. The question remains… what is next? Arisxandra, if you or any of your family members are reading this, maybe it is time for you to take matters into your own hands. The times have changed, Youtube is now your own TV channel and the whole world is your audience. Do what Jasmine Thompson has done… do your own channel, make your own videos and let the world see your true talent and beauty. I want to buy her cd, I am her fan. I am thinking – how could we, as a people, could help this talent to break the roof of entertainment authorities? What could WE do for her? we should start up a fundraiser in her name with a trustworthy banking institution and have people donate to help her. god we do it for these money grubbing politicians all the time. why not donate to someone who at least sings her heart out and wants only to be recognized and help her family. I would be the first to donate but not sure how to get it started. Arisxandra’s case – and there are others- demonstrates to me how extraordinary public voting can be. She is a born genius. Arisxandra a real talent having a voice like liquid gold she will be star of the world I think. I am a big fan of her, too. Why haven’t big labels offered her a contract? Is there anything more she needs to prove? BTW, 2.9% of votes for her last performance (the final) is outrageously low. Let’s try and see if her critics can do any better. If they can’t, they should shut up. I thought a few years ago after BGT she signed a recording contract with a Filipino company??? She has an inspiring story that also attracts non Pinoys. I was wondering recently if at that age she is changing and maybe moved into more “”groovey” music – I hope not. She is also well known in Australia. Iam a huge fan I listen every morning whenI wake up she is gifted god child .God bless you my child. .. So talented, an Angelic voice! I am wondering if Arisandra had petitioned for The Voice (USA). Me too a huge fan of Arisx, I don’t get tired watching her performance in the U tube that gives me goosebumps every time I watch her. Can someone please help her by getting Ellen to listen to her and then bring her over to USA to perform on her show. I have listened over the years to many singers of all ages. Arisxandra has an angelic voice and definitely should come the the USA and perform on one of our shows. America will love you. I am a 77 year old man, a retired teacher and I have loved your singing voice since I heard you on Britain Has Talent, the first time. Please don’t give up.